Is the root of a coniferous tree suitable for an aquarium? Is the root of the fruit tree suitable for an aquarium? Does the root bought in the pet store need to be prepared? When will my root sink? Is brown water harmful to fish? These and other questions bother many, more or less experienced, aquarists. Because there are many myths and untrue information about the properties of the tree, its toxicity, suitability or applicability in our tanks, I will try to bring this topic to our readers in this article. coniferous trees – in Poland common occur: pine, spruce, fir, larch and yew. And how to check whether we deal with deciduous or coniferous wood. There is a simple method that requires drilling deep holes in an invisible place and sniffing shavings. Softwoods will be recognized after the resinous smell (turpentine fragrance), the fir additionally emits a vanilla scent, oak wood and black poplar give off a distinct scent of tannins – a tart-sour smell. heartwood, non-heartwood / sapwood: almost every tree with age (different for each species) produces heartwood, that is, it loses the ability to conduct water in some of its cells. These cells are impregnated with heartwood substances: resins, gums, tannins, dyes, etc. The heartwood always appears in the oldest part of the tree, i.e. its center and extends towards the outside. The remaining part of the tree, the one that conducts water, is called sapwood. The ratio of heartwood to sapwood depends on the species of the tree. There are also several species in which the heartwood doesn’t arise at all. They are: birch, beech, hornbeam, sycamore, chestnut, common maple, alder, aspen. Heartwood has a higher density than sapwood. chemical composition of wood: each type of tree consists of cellulose, lignin, hemicelluloses and additional substances, where the first 3 compounds make up 90-95%. Depending on the type of tree (deciduous, coniferous) the percentage share of the main compounds is different. Coniferous trees contain more cellulose and lignin in relation to deciduous trees. From the aquarist’s point of view, additional substances are important, which are more or less toxic to the inhabitants of our aquariums. These include tannic substances (occurring in all types of trees) and resins (occurring only in coniferous trees). These substances are primarily used to protect plants in the event of damage, as a result of fungi, bacteria or pests. Hazardous / toxic substances for fish are mainly: tannins and other phenolic compounds contained in deciduous wood (tannin substances), cyanogenic glycosides in fruit wood (a type of tanning substances) and resin acids, phenolic acids in coniferous wood (resins). Toxicity of these compounds lies primarily in their getting into the aquatic environment and undergoing transformations that lead to a change in the properties of this environment. Some of them dissolve in water, some do not, some are hydrolyzed, resulting in new compounds, etc. there are other ingredients that are dangerous for fish that trees produce for protection. An example may be taksin (toxic alkaloid produced by yew) or sambunigrin (poisonous glycoside produced by lilac). It is also worth discussing some parameters of the tree, which are important from the point of view of the aquarist. Belong to them: wood permeability – this is the ability of wood to absorb water. This size is strictly dependent on the density of wood – as its density increases, its ability to absorb water decreases. A low density tree (and what follows, it is of lesser weight) has more pores / voids through which water flows freely. Such a tree needs less time to completely soak – that is, sink in a shorter time. wood drying time: the length of this time depends on several parameters: the type and thickness of wood, air circulation speed (the higher the air flow, the faster the wood dries), the humidity of the air and the condition of the tree surface (wood with bark dries significantly slower). Here, too, the density of wood has an influence: high density – longer drying time, because the pores / voids are smaller and the air has greater difficulties in free circulation. There is no tree that would be indifferent to the inhabitants of the aquatic environment. Each type of tree contains in its composition some toxic compounds that under the influence of water are washed away and may pose a threat if a specific concentration of this compound is exceeded. Wood preparation is aimed at disinfecting wood, neutralizing dangerous compounds to minimize their toxic effect in our aquarium. Therefore, this action is necessary for both purchased roots and those that are self-selected. The method of preparation of wood strictly depends on its type: deciduous, coniferous, fruit and whether it is fresh (live) or dried (dead). The roots / pieces of wood / decayed branches (at various stages of decomposition) and covered in a large part with molds / fungi, etc., are not suitable for preparation. The substances harmful to fish in this case are tannic substances (mainly tannins and phenolic compounds), which should be significantly minimized by proper wood preparation. checking if the root doesn’t color the water and whether it sinks – put it in a container with water (temperature such as in an aquarium) for a few hours. If the water is not tinted or tinted only slightly, and the root sinks without a problem, you can easily put it in the aquarium (in the second case remember the systematic 10-20% water changes until the dyeing subsides). When the root is not sinking, we load it and wait until it soaked (it gets saturated with water). When the root stains the water very much, we also leave it in a separate container, we change water every day and wait until the dyeing completely or substantially disappears. placing the root in the aquarium. The substances harmful to fish in this case are tannin substances – cyanogenic glycosides, which are perfectly soluble in warm / hot water and are removed with it. Therefore, only large roots require earlier seasoning / drying. Using this method we should be extremely careful when in contact with chemicals and during the bath – use personal protective equipment (rubber gloves, eye protection, respiratory protection) and the entire process carry out in a well-ventilated room. Wood preparation using this method is intended for adults and responsible persons. Theoretically well-prepared softwood should not pose a threat to our fish. However, in practice, it may turn out that the saponification process was too short and the sodium hydroxide wasn’t completely neutralized. Therefore, each aquarist has to decide whether he wants to bear the risk associated with it and expose his charges. Large roots that do not fit in any cooking utensils should be boiled in water (with disinfectant or not) in a suitable container, eg a tub, barrel, etc. 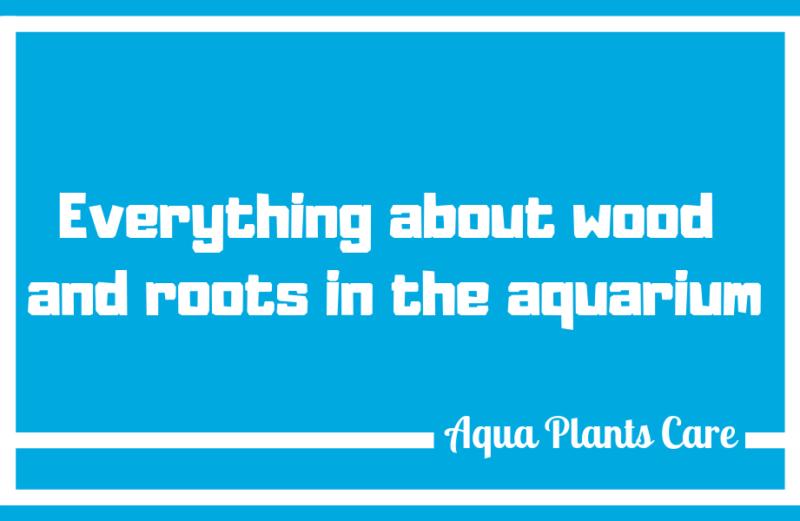 Each root, regardless of the type of wood, undergoes gradual decomposition in the aquatic environment. As a result, a brown coating is formed on the root that soils your hands. Under suitable and favorable conditions, the wood is also attacked by various species of fungi (mostly mold) or bacteria. We should then examine the water parameters, remove the possible cause of the mold and clean the root mechanically and through reboiling it (fungi die at 60°C). Poorly prepared root or rotten root / which is already rotting dyes water significantly, can cause spoilage of water, its unpleasant odor, fish death. We don’t varnish the roots – every type of paint is toxic, not to mention that the varnished root will never sink, and the wet root can not be painted (the paint will not stick).